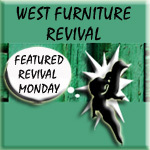 Not all of us have loads of time (or cash) to redecorate our homes with the changing seasons. Sometimes simple changes can create a larger impact than we think. 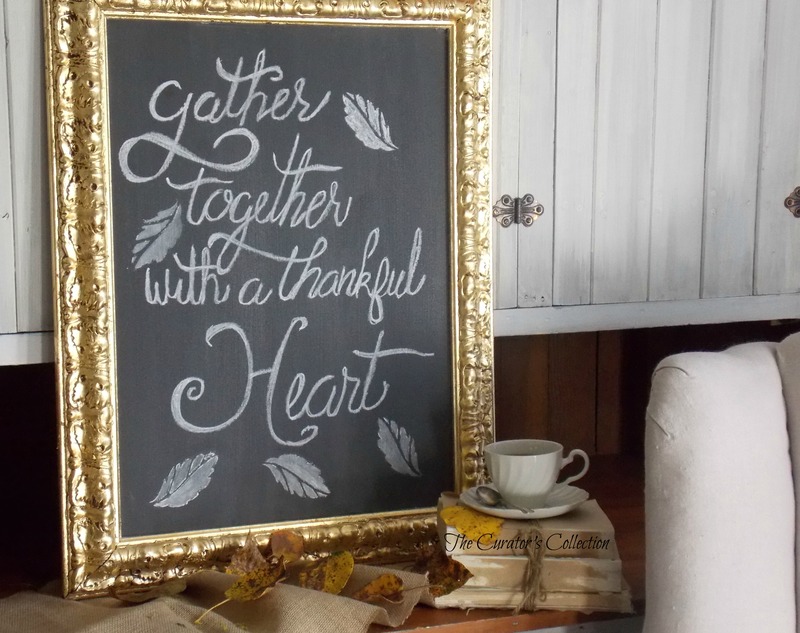 Chalk boards are so versatile to use as home decor. You can create and decorate them with whatever you like for whatever season you like. A while back I had purchased an old ugly picture purely for it’s frame. I decided that I was going to try my hand at gold leaf for the first time. Turns out gold leafing anything is not my gift, nor do I have the patience for it. Here is how it turned out. It is pretty on it’s own but I had no idea what I wanted to do with it so it hung on the wall in my garage for a while. Then came the urge to start decorating for fall. 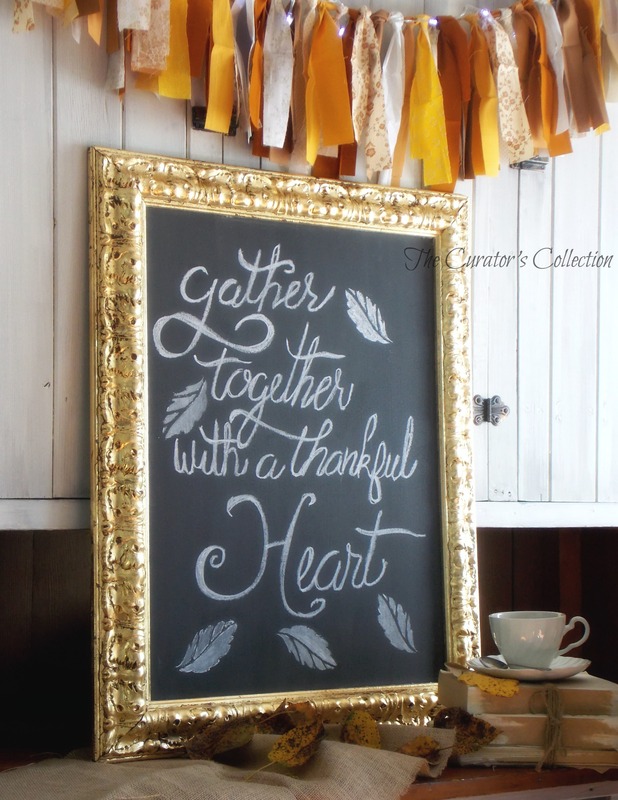 All the beautiful warm fall colours inspired me to bring it back inside and why not make it into a gorgeous chalk board. I found a piece of backer board and cut it to size. Then I painted it with 2 coats of MMS Milk paint in Typewriter followed by a light sanding. After sanding I wiped it with a damp cloth to remove the dust. Because I sanded it, there was no need to season the board. I almost like using the Milk paint better than actual chalkboard paint for creating chalk boards. No brush strokes or bumps. Chalk boards can be placed anywhere in your home both on the wall or propped up to create the perfect seasonal vignette. 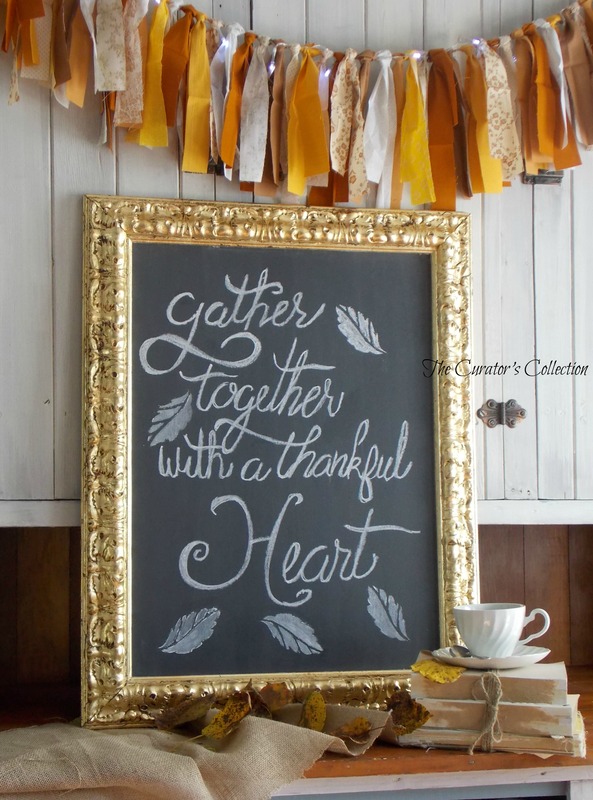 I added a little burlap and some leaves and a rag garland in complimenting fall colours to create mine … and don’t forget to add the appropriate inspirational typography for the season. What a pretty vignette for fall. Thank you Debra! With all that has been going on here, decorating has to be simple and fast ;) Next week I can focus more on home… share more soon! I hope you have an amazing week! Love this simple idea with big impact! Great job! Thank you for taking the time to say so and for the compliment! I hope you have a great week! I couldn’t agree more about milk or chalk paint being much better (and less expensive) than chalkboard paint. Much smoother finish and quicker drying time. 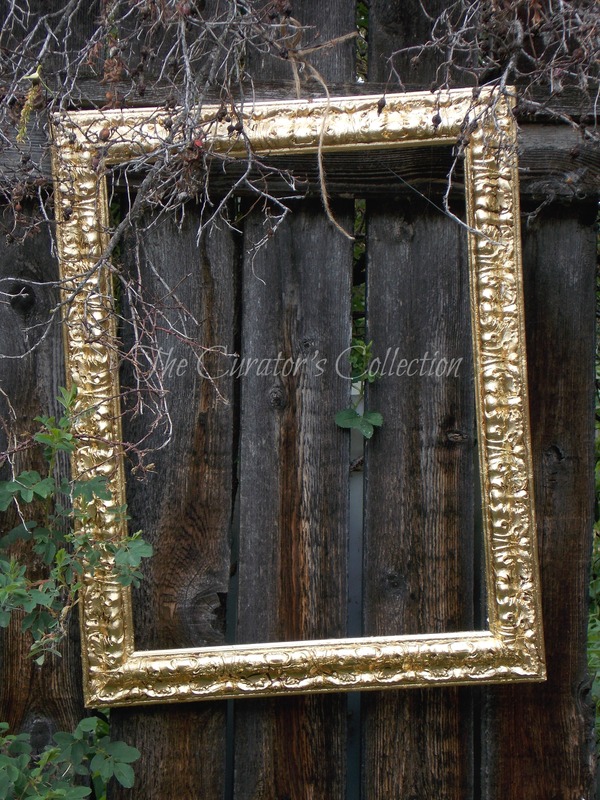 Your gold leafed chalkboard is so elegant! Thank you so much Marie! I hope you are have a great week my friend! I love a good chalkboard! Yours looks great and was the perfect use for that frame. I’ve never tried using the MMS Typewriter for a chalkboard, but I did try her mix for a green chalkboard using Boxwood and Artissimo and loved how that turned out. I love the green too! I have found that people actually prefer the green when I go to markets .. they sell before the black ones. It looks more authentic. Thank you for the sweet comment! Hope you have a great day! Is there anything you can’t do? I’ve yet to find it. Even your printing! Awe! You are sweet my friend! Yep … there’s a tonne of things I can’t do … I should share some of those posts with you lol! I eyeballed another photo for the printing and tried repeatedly to get the lettering right on this one ;) Turned out okay! I hope you have a great day! Smiles! I do not get it in my news feed, I have re subscribed twice a while ago in case the issue was on my end but I still don’t see it unless I manually look you up. I hope you can get it figured out easily! Let me know how it goes! Thank you! I’ve contacted support several times but they don’t understand my question somehow. Sigh. Awe … I hope you can find someone to help! I wish I was a little more techy too! I just posted a new one, can you tell me if you got it? If not, can you look under the tag DIY in the reader for me please? If I go to any of the tags I listed, I still don’t see it! grrr. Thanks Miss T.
Woo Hoo! I see it ! I see it!!!! I got it in my e-mails before I had it on my newsfeed. Sorry for the late response … I’m having squirrel syndrome lately and got pulled away from my computer and then distracted, and distracted, and distracted …. ;) I’m hopping over there now to see this deliciousness! Milk paint idea sound cool! I love using Milk Paint for making chalk boards, it’s nice to be able to recreate the authentic green colour as well with it! I hope you ave a great day! 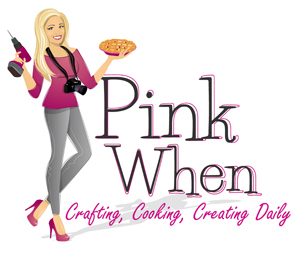 Thank you for sharing my fall post Jennie anne! You’re sweet for sharing!